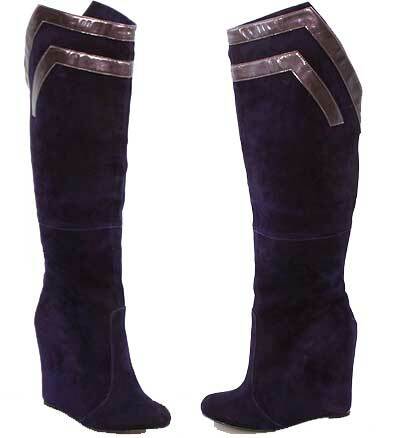 A couple of days ago I said that every superhero needs a good pair of boots. Well, I think I just found mine. These are by Melody Ehsani, and they just scream “superhero”. The gold trim is the detail that does it, I think, but the wedge heel, plus the pointed shape of the leg, also gives these a bit of a futuristic/comic book look that really appeals to be (naturally). That wedge should also mean that although the heel is high, it should be relatively easy to walk on – always a good thing, especially in boots that you’re probably going to be wearing in the slippery winter months. Although they initially looked black on my monitor, these are actually a deep purple. Which I think makes them even better. I was unconvinced until I read the word purple. Ooooh, yes! The trim is lovely! I can imagine how gorgeous they’d look over a pair of skinnies!